Headed to the shred bin? Ever wonder what not to shred? While going through a purge of old business documents is a good thing to do after your annual income tax filing, not every document in the office is destined for destruction. 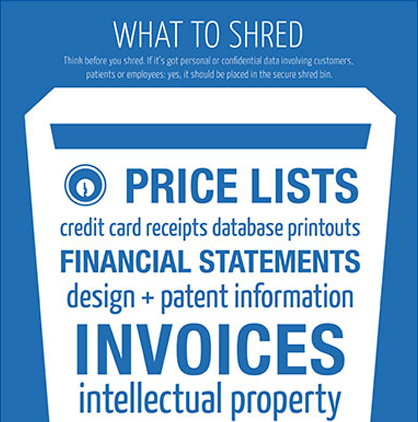 Shredding is one aspect of file organization and a good records management company shouldn’t always tell you to shred everything. Especially during tax season, you’ll want to make sure you have a handle on all your key financial documents. Let’s be clear: saving certain files may help you in the long run. Here are five kinds of files to save, not to shred. Business income tax returns and supporting documents. Keep a record of your tax return. It can help you file for the coming year, and serve in case of further IRS audits. Remember, one reason the IRS can audit your business is for failing to report income that is more than 25 percent of gross income. Supportive tax documents should be retained at least six years. There are three important questions you should be asking yourself about the security of your client’s financial data. If you have employees, the IRS recommends that you hold on to employee information for at least four years. That can include employment ID information, such as names, addresses, and social security numbers, records and amounts of wages, pension plan payments, and even employee emails. Worker’s comp claims should be kept for the life of the claim; these are definitely documents not to shred. These records will aid you in calculating applicable depreciation, amortization or depletion deductions and to determine any gain or loss on that property. Hold on to documents related to anything that you consider an asset—such as the deed of a property, vehicle titles, or equipment—in a secure place until it’s no longer owned by your business. Canceled checks, bank statements, and credit card statements. Canceled checks should be saved for a year. The exception: never throw away checks made out to the government. Annual credit card and bank statements should be saved for 7 years, and even longer if they serve as supporting tax documents. Keep the monthly detailed statements for about a year before safely disposing of them. In the case of pending legal action, even the six- or seven-year rule may be over-ruled, and you’ll be required to hold on to certain records even longer. To keep track of the various timelines, adjust your record retention schedule accordingly. General information about your business, such as profit and loss ledgers, and major announcements like annual corporate reports, are recommended to be saved permanently as a record of your business. Other financial information not needed for tax purposes, such as accounts payable and receivable, invoices, and expense reports, should still be kept for at least seven years. Now that you know what to save, make sure you have a place to store your documents. Remember, none of these files should be stuffed in your desk drawer. Consider secure off-site storage. Just be sure you choose a record management company that can offer you 24-7 online access to your offsite files.